Mince pies, ruddy-cheeked children, tracking Santa via Nasa’s satellites... Christmas is brilliant. Well, unless you’ve forgotten to buy a present for a loved one, can’t get everybody to agree on the perfect playlist or forgot that turkeys take about three years to defrost – in which case you’re entirely screwed (just like the battery cover on the remote-controlled car that you don't have a screwdriver for on Christmas day). But don’t despair! In your purse or pocket there’s a superhero with more powers than Saint Nick: your smartphone. We’re going to show you how it can save Christmas for everybody – and the best thing is they never need to know about your ‘slight mistakes’. Still haven’t got all your presents as Christmas Day approaches? You could pop down to the local 24-hour garage to grab some festive charcoal, or a faintly-repellent air freshener. Or you could whip out your phone and order online gift vouchers from the likes of Amazon, Google, Apple, Ticketmaster or nearly any brand whose goodies you fancy gifting. Just make sure the firm isn’t shaky financially, as vouchers are only good if the company stays in business. And don’t forget about Deals Radar, where we curate a daily guide to the very best online bargains if you’re smartly buying your gifts from the sofa ahead of the Yuletide gathering. If it’s not too late and the shops are still open, those desperate for a last-minute gift may be tempted to grab the first thing within arm’s reach, thrusting a credit card at anyone with a terminal. But pause, take a breath and pull out your phone, as price comparison apps can ensure you’re not being rushed into a rash purchase by telling you whether the price you're seeing is extortionate, if it's cheaper online and if you can still get it delivered in time. Plus if you use apps such as Quidco or ClickSnap, you can get cashback on your purchases too. Your playlists of obscure German techno aren’t going to thrill anyone who’s appeared at your house ready to embrace the cheer of Christmas - but with your phone, you’re three clicks from the perfect playlist. Provided you stay away from the obvious no-nos - Slipknot, Einstürzende Neubauten, Cliff Richard - you can rely on your favourite streaming service such as Spotify, Tidal, Apple Music, Amazon Music Unlimited or Google Play Music to provide the right Christmas soundtrack. Unless your phone has a superb set of speakers (such as the HTC One M9 or the new Moto Z family with clever MotoMod JBL speaker magnetic clip-on) you’ll need to team it with a speaker (either through the headphone jack or Bluetooth) or use Chromecast to stream the sounds into the living room. You don’t even need to create the playlist, as the all the streaming services listed will do that for you with ready-made Christmas joy a tap away. Just double-check their playlists don’t include an abundance of Cliff and you’ll be able to make it through the day without losing your mind. Screaming toddlers? Two words: Peppa Pig. Three more words: on your phone. And if you can’t bear the thought of hearing the bing-bong song one more time, there are Peppa Pig apps that you can thrust into the hands of your darling little ones. Even if Peppa isn't your kids' thing, thanks to on-demand apps such as Amazon Prime Video, and Netflix there’s no need to panic if you’re stuck with antsy children in a house without a TV. Just don’t forget about them with your phone, OK? We’re not advocating melting a child's brain just because they’re making slightly too much noise. In the days before the internet and CDs, gamers had to load their games from cassettes, or worse: type in the code by hand. That’s still much faster than trying to get a modern games console to play anything, because even something akin to Pac-Man will require a 400GB system update and sixty billion patches before you can see a single damn dot. And that’s assuming the internet works, which it won’t because everybody in your street is downloading 400GB system updates. A good move is to pull out your phone and check online to see if there’s an update for the console you want to use (spoiler alert: if you’ve just bought it as a gift, THERE WILL BE MANY) so you can set it up before the urgent need to play arises. Or let’s assume you just can’t get onto the PlayStation because the family is watching a Christmas special; now you can fire up your smartphone to indulge in one of the many decent games available now - some of console quality. And if you’ve got a PS4, Remote Play on Sony phones will let you fire up and stream the gameplay direct to your handset’s screen. Just connect your phone to your console by logging into the PlayStation Network, and you’ll be able to play your games anywhere in the house, bypassing TV wars completely. If you’re cooking a traditional Christmas meal with a rather large turkey, then you do know that a big bird like that takes more than a day to defrost, don’t you? If you didn’t, don’t despair: you can surreptitiously point your phone at Lifehacker for the complete guide to panic-defrosting as well as other guides on how not to make dinner a disaster. However, if your problem is you’ve burnt everything and the kitchen is full of smoke and people screaming, then point your browser at Supercook.com instead. It enables you to find recipes based on whatever’s left in the kitchen cupboards, fridge and freezer. If all else fails, there’s always bacon. Fried bacon, roasted bacon, bacon cooked in the microwave… mmm, bacon. Is there anything more Christmassy than eating Christmas cake on Christmas after Christmas dinner and you’re listening to Christmas carols and it’s a white Christmas? Yes: doing all of those things in front of a roaring fire. 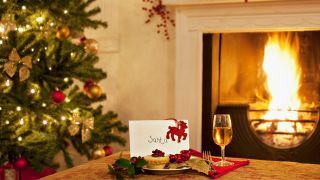 That’s probably what you’re doing if you have a fireplace - which also helps in the Santa department - but without it, Christmas can feel a little hollow. Fire up your phone, log in to Netflix and thank the little streaming elves who bring you Fireplace For Your Home, which offers roar and crackle to your home (and if you watch it on a Samsung Galaxy Note 7, you might just get some real flames too). It’s ideal for your Smart TV (or to stream to your normal TV via Chromecast or AirPlay) and if you don’t happen to have a big television you can just sit really, really close to your phone or tablet to get the same effect.